Creamy quinoa makes a great hot breakfast now the weather is getting cooler, and a good alternative for those who aren’t fans of porridge. 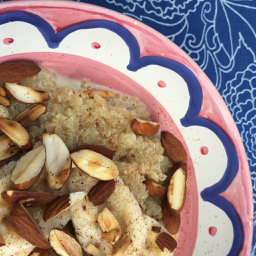 Of course, you can simply cook quinoa in the milk of your choice (just follow the method for cooking times) but I love this version with nuts and cinnamon for a delicious and satisfying start to the day. Combine the milk, water and quinoa in a medium sized saucepan. Bring to a simmer over high heat. Once simmering drop the heat to low, stir well and cover with a lid. A heat diffuser pad is useful if cooking on a gas stovetop. Simmer for about 15 minutes or until most of the liquid is absorbed. Add slices of banana and a generous sprinkle of cassia/cinnamon, stir through the quinoa, turn the heat off and leave the pot covered for another 5 minutes. 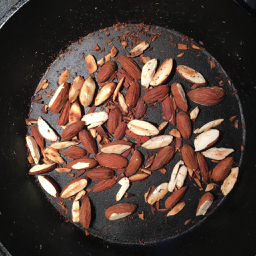 Meantime, toast the slivered almonds in a hot pan until they begin to turn brown. Shake frequently and remember to remove the toasted nuts from the pan the moment the almonds are done, to prevent burning. Spoon the quinoa into the bowls, garnish with another slice of banana or fresh berries, toasted almonds and a drizzle of maple syrup. Tip: if you like a hot pudding in winter – creamy quinoa is the perfect choice (and tastes much better than rice pudding). This recipe is vegan and gluten-free. It can be adapted to work with most allergies. Search the recipe archives for more healthy food ideas. For a simple and delicious recipe in your inbox every month, subscribe to Gill’s monthly newsletter.